I was visiting the parents recently, and found a copy of The Countryman from November 9th, 1961 lying around. For those who don't know, The Countryman is a rural paper from Western Australia. I'll post the fun entries later, but first this. Transcript Below, you don't have to read all that tiny writing. Aboriginals didn't get the vote until 1967, a good six years after this. Pollard is apparently just bran with a bit of flour. There are other contemporary reports covering the same material, which agree on the main facts. I'm not really sure what to make of it. The whole structure and tone of this article just confuses me. Either way, the article itself is more interesting than my rambling so here's a transcript. At the Red Butte on Texas Downs station one night the stockmen were watching cattle held in an old yard - this was a necessity when the yards were old as the wire could easily be broken. After doing a spell on watch, the native, Major, came into the camp, but was ordered to do another watch by the man in charge, Kelly. Major Resented it and cleared out with two other natives. This incident, in 1907, started the three natives on a brief career of murder amid the wild ranges of East Kimberley when this region was real "frontier land". The natives took two rifles and ammunition, and picking up their gins at Texas station they went up the Osmond-River to Growlers Gully where a bushman known as Scotty had his camp. There they stole half a bag of flour and camped near Mt. John. When Scotty returned to his camp he noticed that the flour was missing and saw the native tracks. He put strychnine in the remaining bag of flour, left it in the same place, and went away again. But Major was not to be caught as easily as that. Later, from his tracks, it was discovered that he had looked through the flour and had found the poison in it. He and his two companions then waited close by and when Scotty returned they shot him dead. They took more firearms and ammunition and escaped back into the ranges. The next we heard of them they were on Black Gin Creek off Moonlight Valley where they murdered two white men named Jordie and Kettle. After this every stock rider and prospector went about full-armed and on the lookout for the murderers. The country was in a state of alarm. All the mustering camps kept a careful watch at night and took no chances. At mistake Creek when the cook was on watch one night he woke up Tom Cole to tell him there was a black object near the campfire which was some distance away. Tom snatched up his rifle and fired two shots at it, but on investigation it turned out to be the beef bucket, and it had two holes in it. That was good shooting. 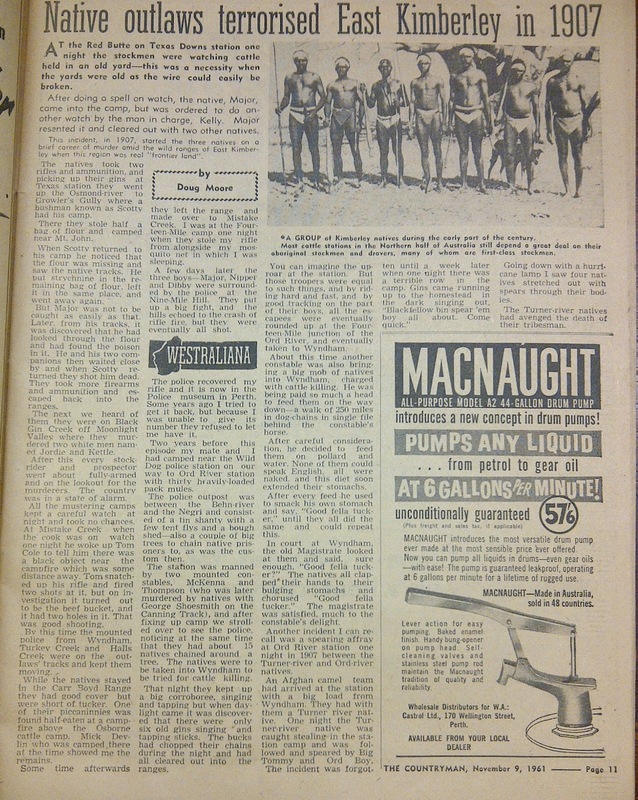 By this time the mounted police from Wyndham, Turkey Creek and Halls Creek were on the outlaws' tracks and kept them moving. While the natives stayed in the Carr Boyd Range they had good cover but were short of tucker. One of their pickaninnies was found half-eaten at a campfire about the Osborne cattle camp. Mick Nevlin who was camped there at the time showed me the remains. Some time afterwards they left the range and made over to Mistake Creek. I was at the Fourteen Mile camp one night when they stole my rifle from alongside my mosquito net in which I was sleeping. A few days later the three boys - Major, Nipper and Dibby were surrounded by the police at the Nine-Mile Hill. They put up a big fight, and the hills echoed to the crash of rifle fire, but they were eventually all shot. The policy recovered my rifle and it is now in the police museum in Perth. Some years ago I tried to get it back, but because I was unable to give its number they refused to let me have it. Two years before this episode my mate and I had camped near the Wild Dog police station on our way to Ord River station with thirty heavily-loaded pack mules. The police outpost was between the Behn-river and the Negri and consisted of a tin shanty with a few tent flys and a bough shed- also a couple of big trees to chain native prisoners to, as was the custom then. The station was manned by two mounted constables, McKenna and Thompson (who was later murdered by natives with George Shoesmith on the Canning Track), and after fixing up camp we strolled over to see the police noticing at the same time that they had about 15 natives chained around a tree. The natives were to be taken into Wyndham to be tried for cattle killing. That night they kept up a big corroboree, singing and tapping but when daylight came it was discovered that there were only six old gins singing and tapping sticks. The bucks had chopped their chains during the night and had all cleared out into the ranges. You can imagine the uproar at the station. But those troopers were equal to such things; and by riding hard and fast, and by good tracking on the part of their boys; all the escapees were eventually rounded up at the Fourteen-Mile junction of the Ord River, and eventually taken to Wyndham. About this time another constable was also bringing a big mob of natives into Wyndham, charged with cattle killing. He was being paid so much a head to feed them on the way down - a walk of 250 miles in dog-chains in single file behind the constables horse. After careful consideration, he decided to feed them on pollard and water. None of them could speak English, all were naked, and this diet soon extended their stomachs. After every feed he used to smack his own stomach and say "Good fella tucker" until they all did the same and could repeat this. In court at Wyndham, the old Magistrate looked at them and said, sure enough, "Good fella tucker?" The natives all clapped their hands to their bulging stomachs and chorused "Good fella tucker." The magistrate was satisfied, much to the constables delight. Another incident I can recall was a spearing affray at Ord River station one night in 1907 between the Turner-river and Ord-River natives. An Afghan camel team had arrived at the station with a big load from Wyndham. They had with them a Turner River native. One night the Turner river native was caught stealing in the station camp and was followed and speared by Big Tommy and the Ord Boy. The incident was forgotten until a week later when one night there was a terrible row in the camp. Gins came running up to the homestead in the dark singing out "Blackfellow bin spear 'em boy all about. Come Quick." Going down with a hurricane lamp I saw four natives stretched out with spears through their bodies. The Turner River natives had avenged the death of their tribesman.